"When her brother Claude was at work, Libba snuck into his room and borrowed his guitar. "Dang!" she whispered. Claude was right-handed. Libba was not. She turned the guitar upside down and played it backwards. It was kind of like brushing your teeth with your foot. Or tying a shoe with one hand. Nobody else played that way, but it was the way that felt right ... "
As a child Elizabeth Cotten felt music from the top of her head to the tips of her toes. Her everyday life was filled with sounds that were music to her ears. "She heard it in the river when she brought in water for her mother. She heard it in the ax when she chopped wood for kindling. She heard it in the freight trains moving down the tracks near her home." She loved to play her brother's guitar when he was not at home. When he moved out and there was no guitar to play, Libba went to work doing what she could to earn money to buy one of her own. Five months later she had the $3.75 she needed to buy it. She played it endlessly, even writing her first song before she was 13! Then life got in the way; it wasn't until she was a grandmother working in a department store that fate stepped in and offered a new musical path. Helping a little lost girl find her mother led Libba to meeting Ruth Crawford Seeger. The two hit it off, and soon Libba was hired as housekeeper for that musical family. "You could hear banjos in the bedrooms, pianos in the parlor, and bass drums in the basement." Once the family was witness to Libba's musical talent, they got the word out. Finally, Libba was able to share her gift with people around the world in concert performances. Using graphite and digital color, Tatyana Fazlalizadeh creates images dominated by the guitar Libba so loved, and the music that spoke to her soul. 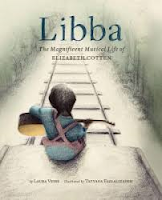 I appreciated how she used a train to show Libba passing through various periods of her life, as a train was such an important part of the music she heard around her when she was a child. A lengthy author's note chronicles Libba's life, and shares the author's keen interest in her subject. Works cited include websites, videos, interviews, recordings and liner notes.